In May 1972, the plane of Lewis "Billy" Hogan Jr. went missing. Neither his body nor the plane were ever found. However, his brother, Jerome Hogan, seen in 2015 holding a photo of Billy, continues looking for a crash site and remains. Like many folks in Maine, Jerome Hogan of Bangor cannot wait for spring to come. 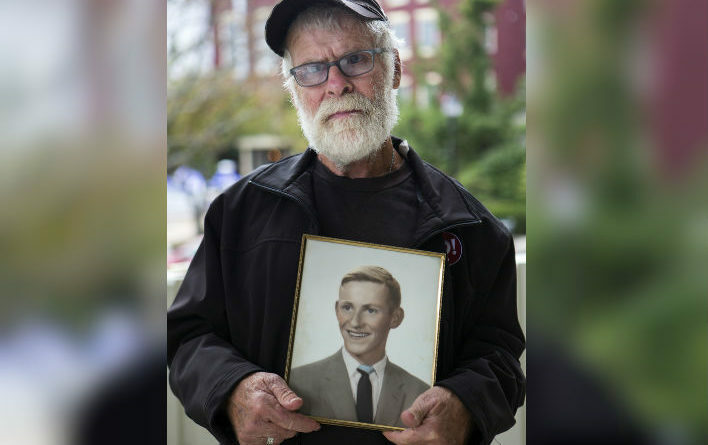 While he will be just as happy as other residents to see the snow melt, he is mainly excited for another reason — springtime means that the search can resume for his brother, a pilot who disappeared nearly 47 years ago. Three years ago, Hogan worked to renew interest in the search for his missing brother, Lewis “Billy” Hogan Jr.
Billy Hogan, a Houlton-based pilot, was 28 years old and working for LISAir when he left Danbury, Connecticut, at 8:15 a.m. May 2, 1972, in a brand-new, yellow-and-white single-engine Citabria. He was expected to land at Houlton International Airport later that day, but communication was lost somewhere between Kennebunk and Augusta. Billy Hogan was never heard from again, and search crews never found his remains or any trace of the plane. The National Transportation Safety Board identifies the flight as a missing aircraft on its online accident database. Search efforts renewed just a few years ago after Jerome Hogan sought help from the Downeast Emergency Medicine Institute, thinking that today’s technology might be used to locate the missing plane, and possibly his brother’s remains. DEEMI has been heavily involved in the search, and the nonprofit organization is gearing up once again to look for any trace of the plane. DEEMI has partnered on the project with the Old Town Aviation Explorers Post 787, a development program for youths interested in aviation careers. Malcolm Brydon, a coordinator with the Aviation Explorers, has worked with members to conduct more than seven searchers for plane wreckage. Richard Bowie, the director of DEEMI, said Wednesday that they are heavily invested in the case, and have done extensive searching and mapping of areas around the state where they believe that Hogan’s plane could have gone down. Billy Hogan was using a type of short-range radio navigation system known as VOR to determine his position and keep the aircraft on course. The system works by receiving radio signals transmitted by a network of fixed ground radio beacons. But on the stormy day Hogan disappeared, the beacon at the Augusta airport was out of service for about four hours, according to the Maine Civil Air Patrol. Officials at the Federal Aviation Administration determined that the pilot called a mayday, which was picked up by the FAA tower at what is now the Portland International Jetport. That was the last time that Hogan was ever heard from. According to news accounts at the time, authorities believe Hogan got lost after he unsuccessfully tried to switch from the Kennebunk VOR beacon to the Augusta beacon as he was flying north. Bowie said that groups from DEEMI and the Explorers post have extensively searched an area of Mount Waldo in Frankfort for plane remnants or remains. That search was prompted by the memories of a Bar Harbor woman who was hiking Mount Waldo in 1978 or 1979. While she was hiking down the mountain, she said that she got lost and came upon the wreckage of a plane she believed could be Hogan’s plane. Bowie said that additional witnesses have come forward about memories of possible plane wreckage south and east of that area, so volunteers will be concentrating on that this spring. A drone team also will be mapping the area, he said, because there are places that are hard for humans to access. They also have searched a river near Portland, he said, after receiving a report of suspicious debris there. It turned out to be a dead end, according to Bowie. Jerome Hogan said in an interview late last week that he will “never stop” looking for his brother. Anyone with more information or interested in helping with the search can contact DEEMI at 207-866-2109.